We often talk to patients who’ve read the latest “must have” personal development book, but are disappointed by the results. Or complete lack of them. And the sad thing is that, more often than not, it’s not their fault it didn’t work. It’s that the concept just hasn’t been put across well. In a way that anyone could understand. And, more importantly, easily incorporate into their lives. Let’s take one of the perennial personal development mantras. Positive thinking. It’s such a simple concept, but so misunderstood. If you’re in any doubt as to how popular it is, just take a quick look on Amazon. When we checked this morning, there were 6,845 books listed on this topic alone – and probably several more by the time you read this! Ok, we hear you saying, positive thinking sounds quite simple. Just think positive thoughts and your life will be transformed. So what’s all the fuss about? Well, try putting it into practise for a day. And this is where most people go wrong. Thinking lovely positive thoughts – whatever life throws at them – is much easier said than done. If you’re in any doubt, imagine getting a flat tyre on the way to work. When you’re already running late. And your first meeting was scheduled for 10 minutes ago. Oh and it’s pouring with rain. However much you try to keep thinking positive thoughts – or muttering them through gritted teeth – it’s going to require a lot of effort to remain positive and upbeat. Isn’t it? So you end up beating yourself up because you couldn’t think positive thoughts. Or give up on the whole concept and put it on the “tried, but didn’t work” heap before moving on to the next thing. But what if you’d completely misunderstood the whole thing? What if there was a much easier way to incorporate positive thinking into your life? To make life flow more easily. 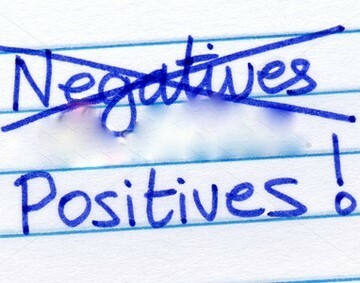 Instead, why not use positive thinking in the way it was meant to be used. To look for ANYTHING in ANY situation you can be grateful for. And in the blink of an eye you’ve changed your focus. From what’s wrong with the situation, to what you’re thankful for. You’re instantly off that downward escalator, where nothing seems to be going right – and why did I even bother getting out of bed this morning – and back on to an upward one. We’re not saying that you’ll suddenly move into a “life is wonderful” state. Tra la la. But you’ll feel a whole lot better – and cope with the situation more easily. So, back to the flat tyre. How about feeling grateful that you didn’t have a serious accident. That it happened when you were going slowly, rather than on a motorway. That you had AA cover and the patrolman was with you so quickly. Whatever the positive is, focus on finding is and you’ll instantly feel much better. Oh, and whichever angle you choose to focus on, make sure that your feelings of gratitude are genuine. If you find yourself saying that you’re grateful through gritted teeth – when you’re anything but – it isn’t going to help. If anything, it’ll make things a whole lot worse. And, yes, we know that sometimes it can test every aspect of your imagination to find anything to be remotely grateful about. But there always is, even if you have to look very hard for it. In those instances, we’ve found that turning it into a bit of a game helps. Of almost daring ourselves to find any positive in the situation, however small. It’s just a case of finding it. And, interestingly, once you do you’ll find that others magically appear too. So does this still sound too difficult to incorporate into your life? Too new agey and navel gazing? We all love to experiment with things, so why not make this yours today? As you go about your day, look for the positive in everything that happens. You’ll be amazed by the things you wouldn’t normally have noticed. And how this can transform your day instantly, without any other effort on your behalf.